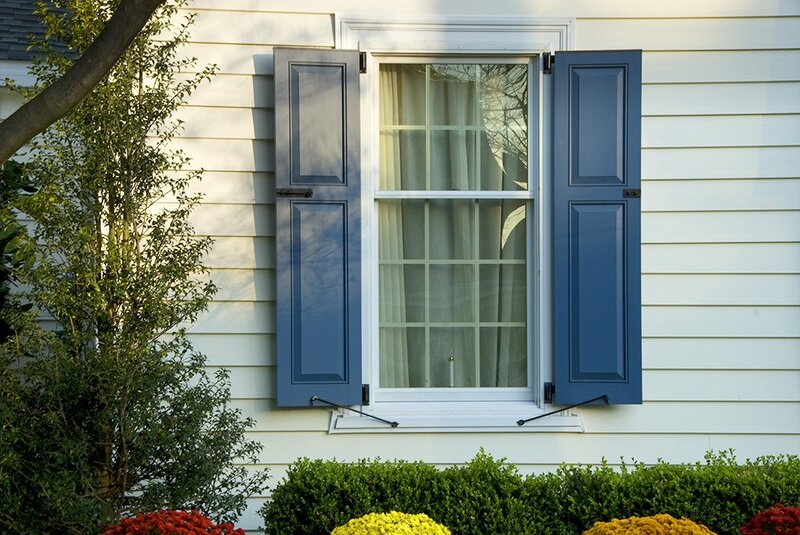 The right shutter can be the perfect accent to a classically gorgeous home. 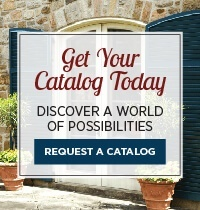 Does your sense of style tend to be more traditional or tried-and-true? 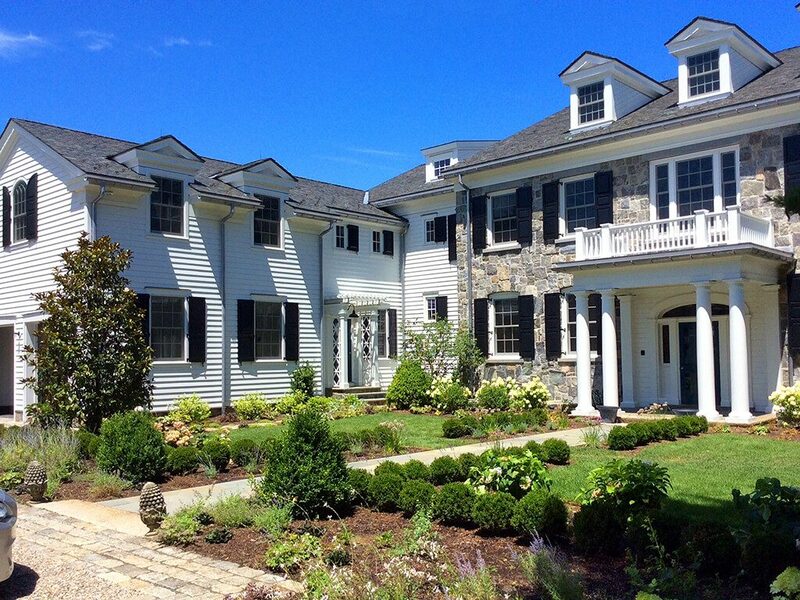 Are you a preservationist with a discerning eye for timeless details? 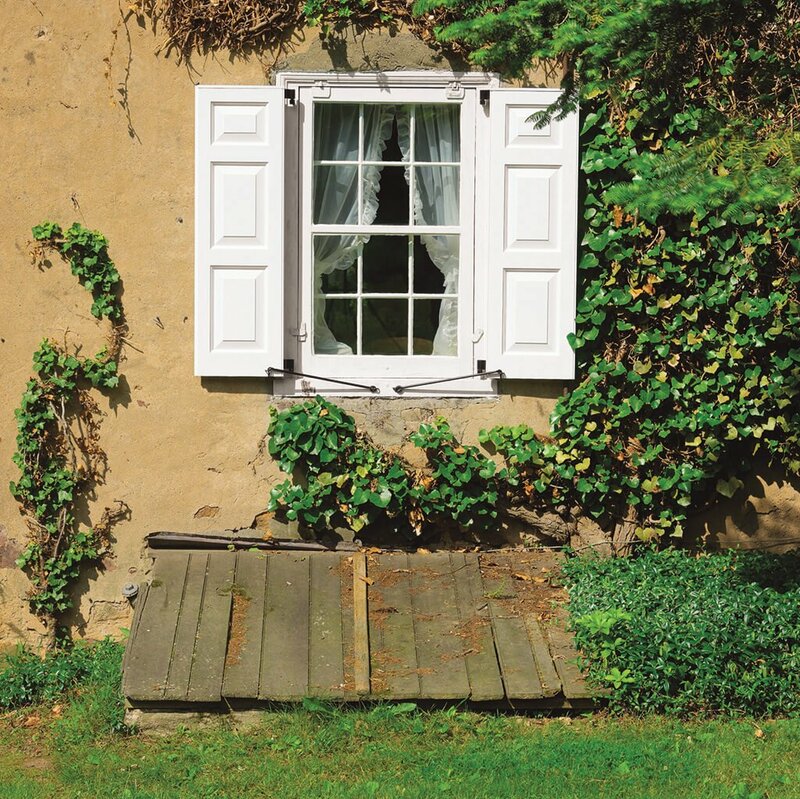 These conventional homes have shutters to match – click through our gallery and be transported by these forward-thinking takes on traditional homes and shutters. 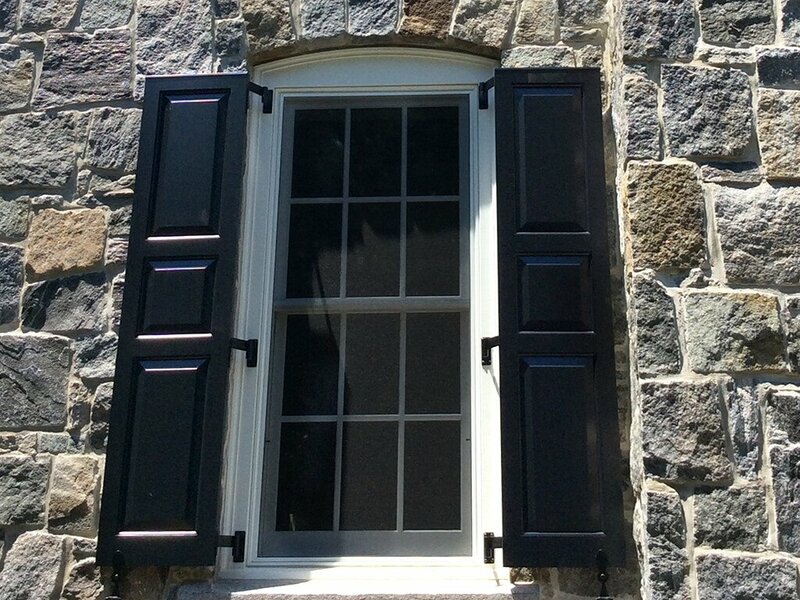 Black, Shaker panels with quarter-round trim in a 40/20/40 configuration attached with plate pintels and finished with Belmont tiebacks. 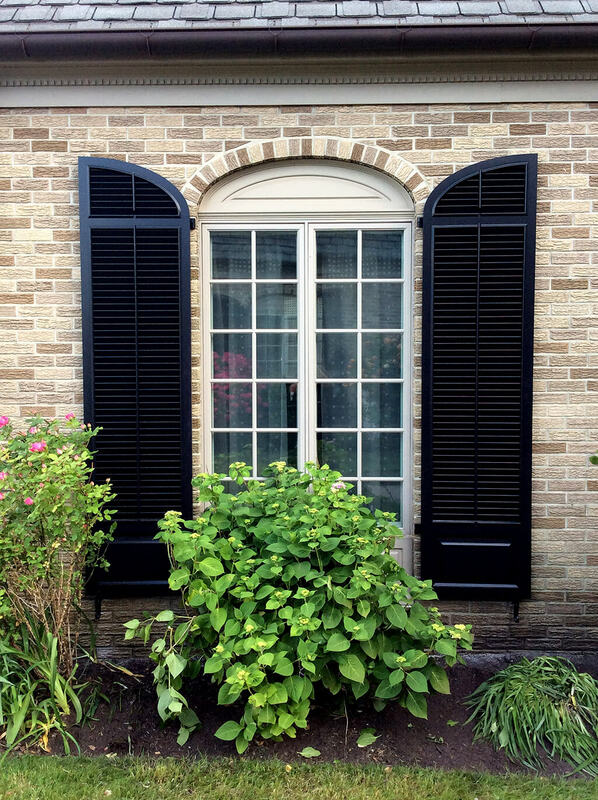 Closeup of a charming Dutch Colonial featuring large, radius top, operable louver shutters with bottom panels in Pitch Black, perfectly fitted to its tall arched windows. 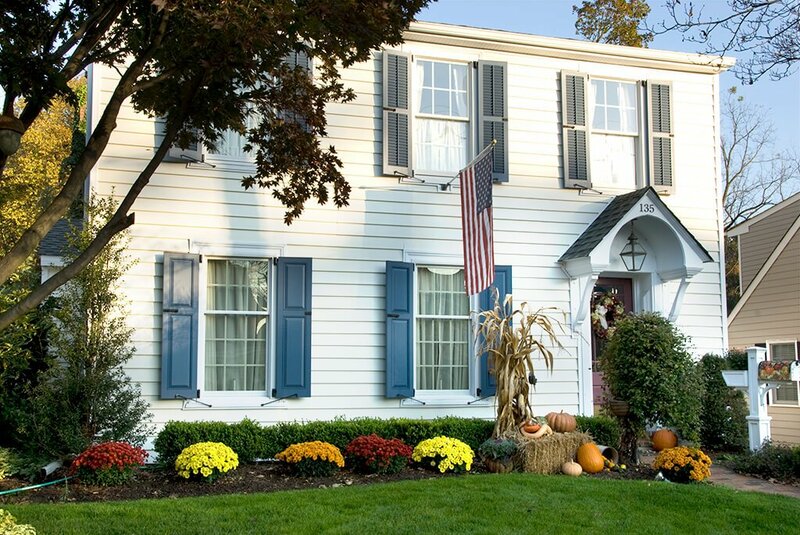 This charming Dutch Colonial features large, radius top, operable louver shutters with bottom panels in Pitch Black, perfectly fitted to its tall arched windows. 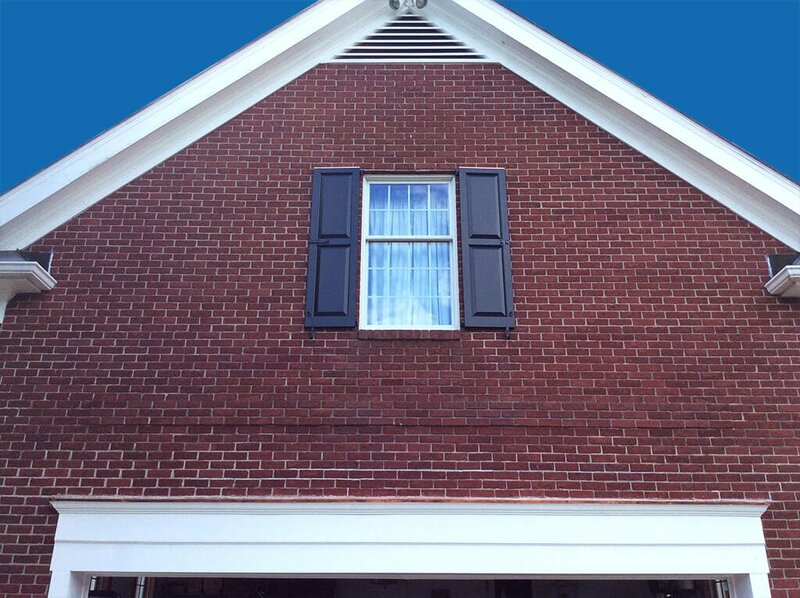 Detail image showcases the contrast between tan brick and Pitch Black combination shutters, complete with operable louver tops and small bottom panels and finished with rat tail tiebacks. 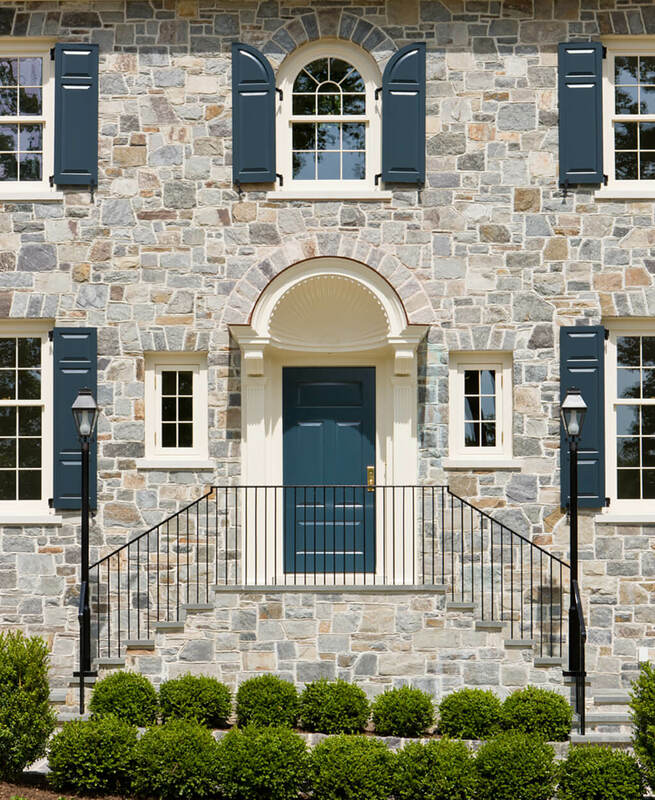 A stately, symmetrical entrance is enhanced with a radius top shutter bringing added attention to the arched window that echoes the curved door below it. 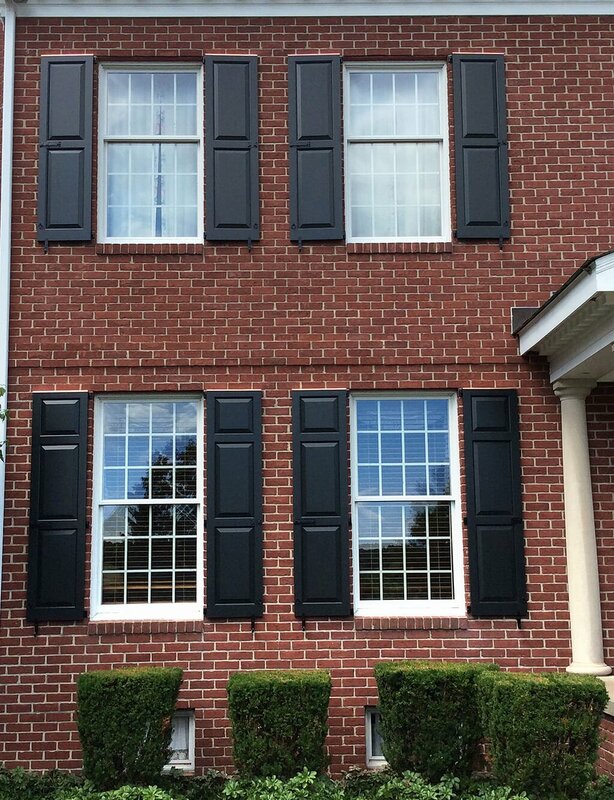 This combination of 50/50 louver shutters on the second floor and 40/60 panel shutters on the ground floor adds visual interest, especially with their black sill mount and slide bolt hardware. 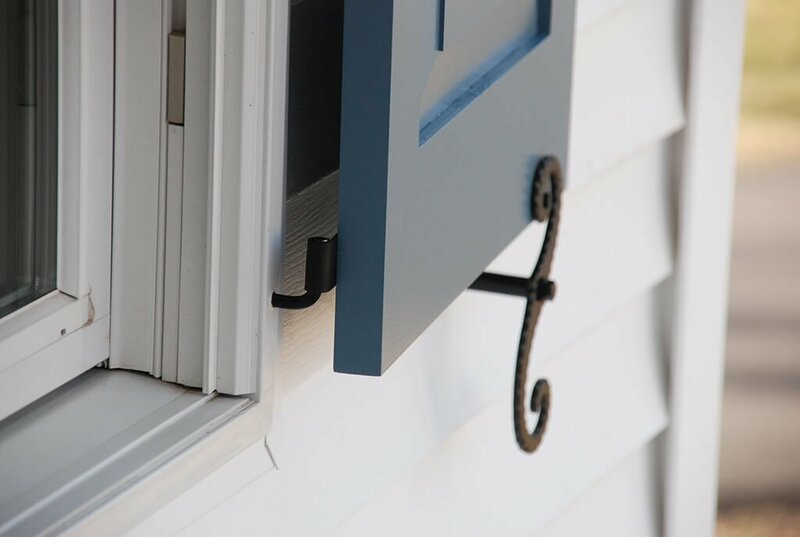 Close-up image showcasing blue Shaker panel with bead trim, finished with sill mounts, slide bolts, and installed for functionality. 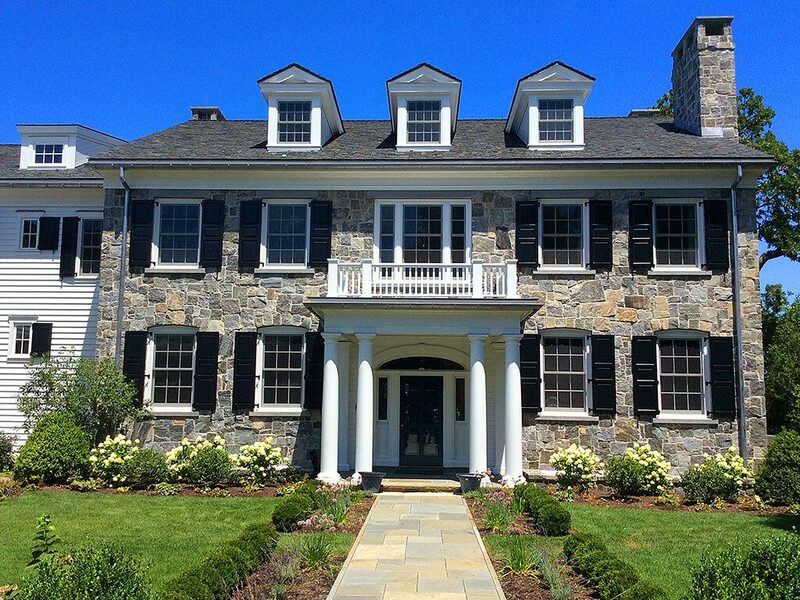 A crisp, black-and-white façade is dressed with Timberlane’s Shaker panel shutters in Pitch Black and “S” Beveled tiebacks. 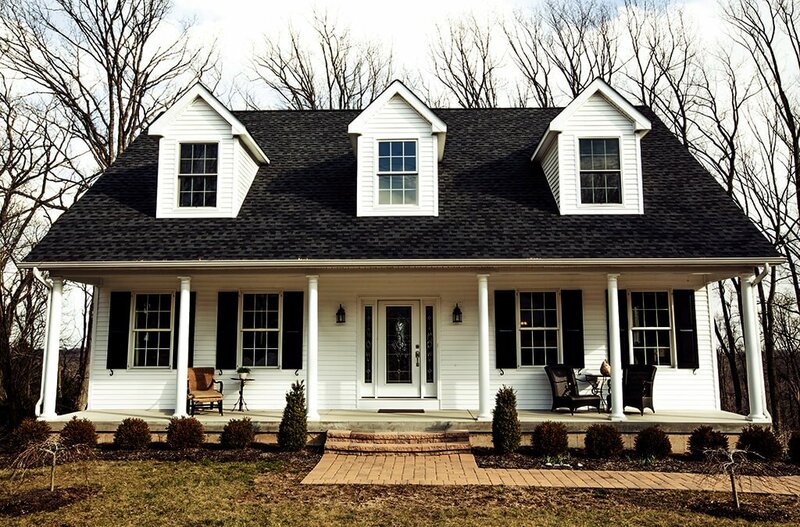 This picturesque black and white home includes black panel shutters and “S” beveled tiebacks. 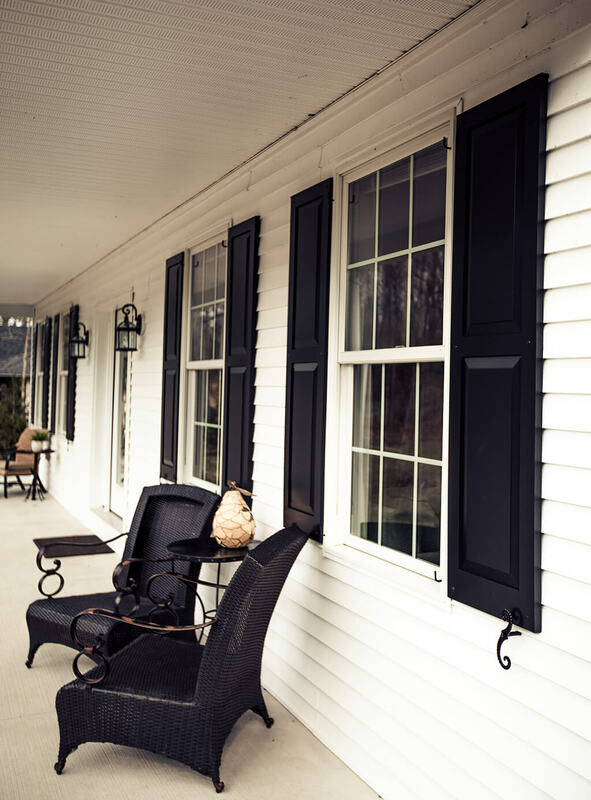 Acorn cutouts add a personalized touch to these neutral recessed panel shutters, finished with shutter capping and our Antique Flower tiebacks. 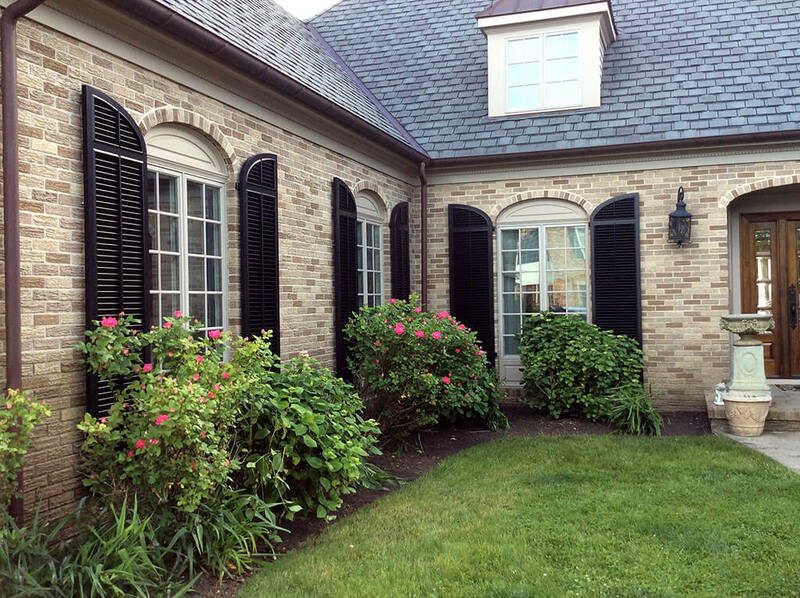 This gorgeous home is fitted with black, radius top shutters featuring operable louvers – a perfect choice for its arched windows and bright white siding. 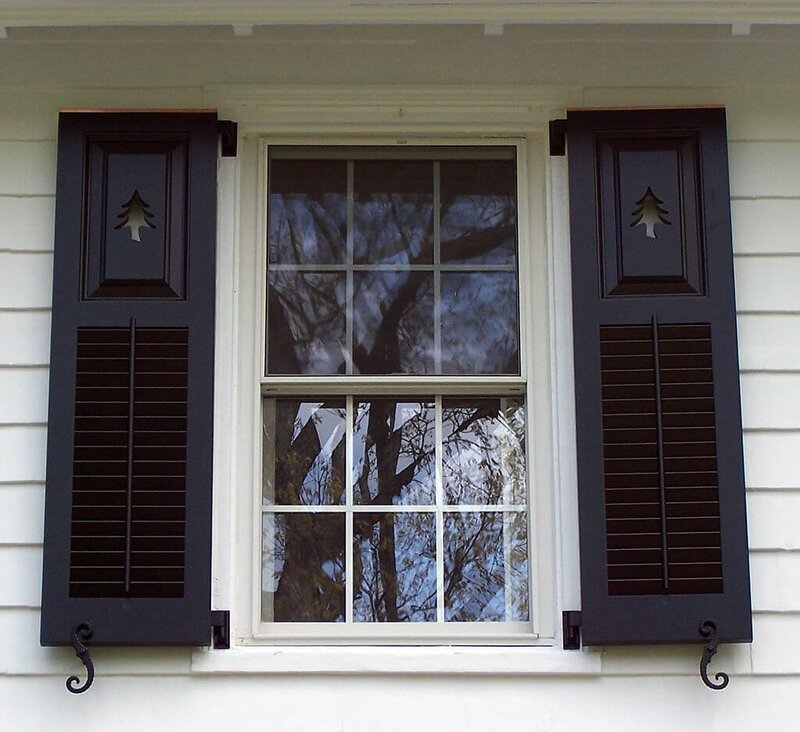 Detail image of combination panel & louver shutters with evergreen cutouts on the panels and operable louvers below. 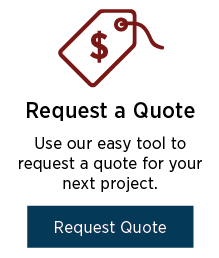 Copper capping and “S” beveled tiebacks complete the look. 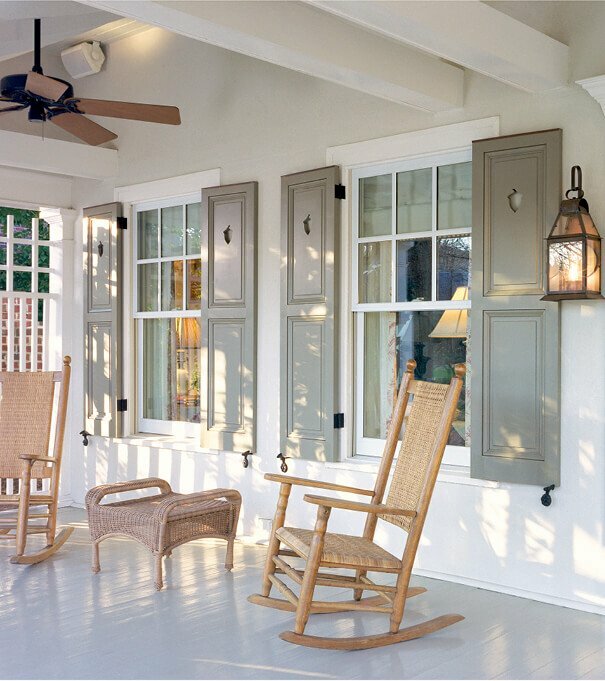 These classic Shaker panels show the added impact shutter hardware. 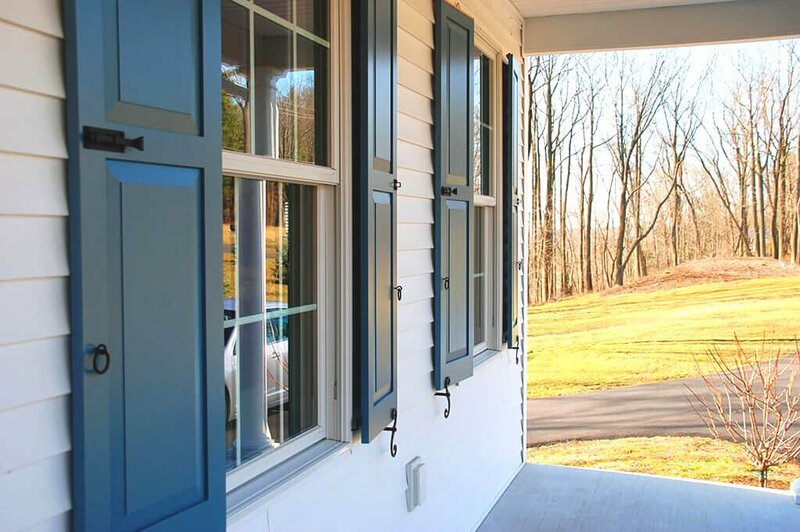 Dark pull rings, slide bolts, and tiebacks contrast beautifully with these blue 50/50 panels, bringing the look to another level. 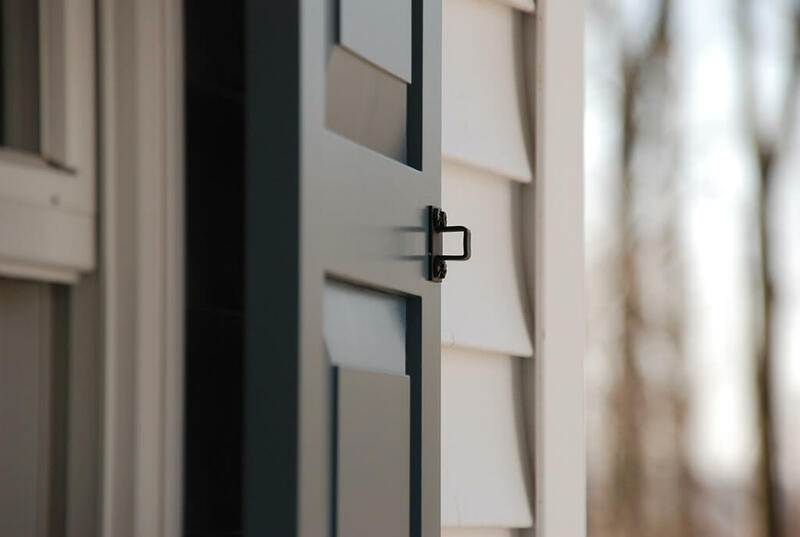 Detail shot of one of our slidebolts installed on a blue Shaker panel shutter. 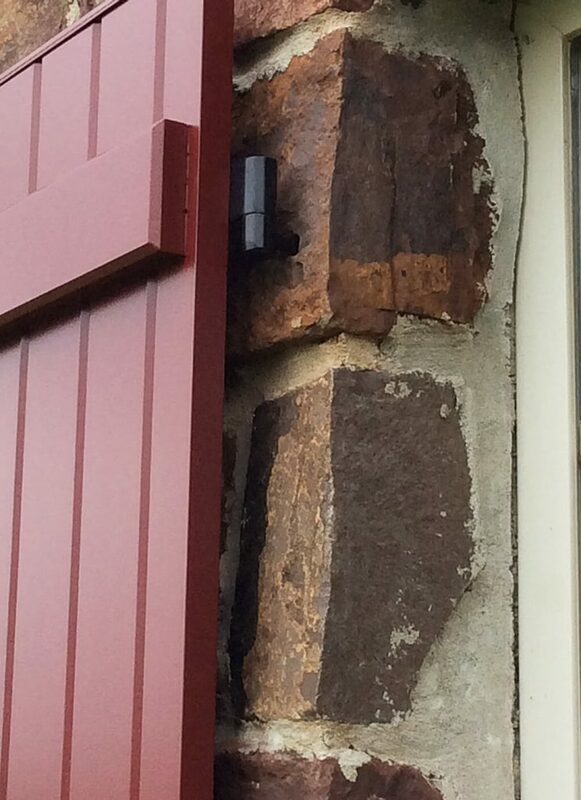 Detail shot of a working hinge and our “S” beveled tieback installed on a blue Shaker panel shutter. 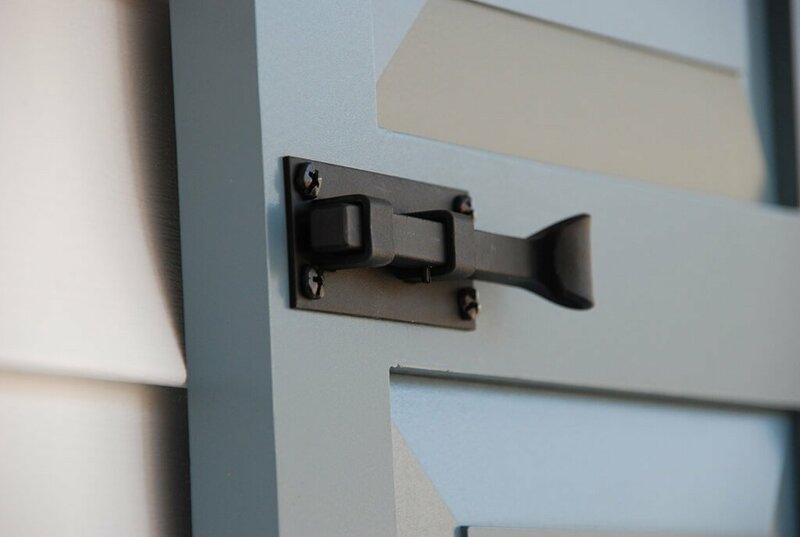 Next Detail shot of the accepting latch to one of our slidebolts, installed on a blue Shaker panel shutter. 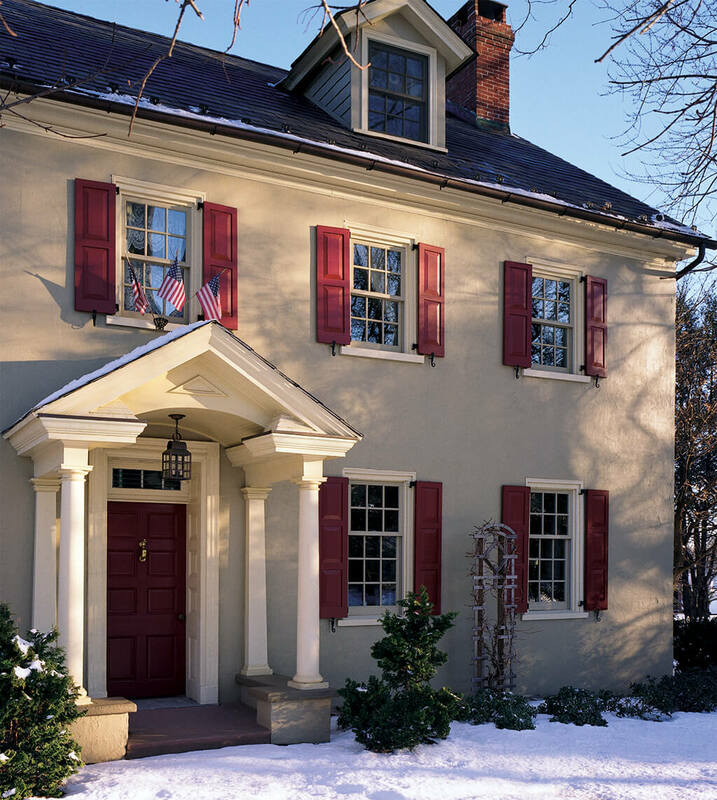 These red Shaker panel shutters give the façade of this home a pop of color and personality, with a 50/50 configuration on top and 33/33/33 below. 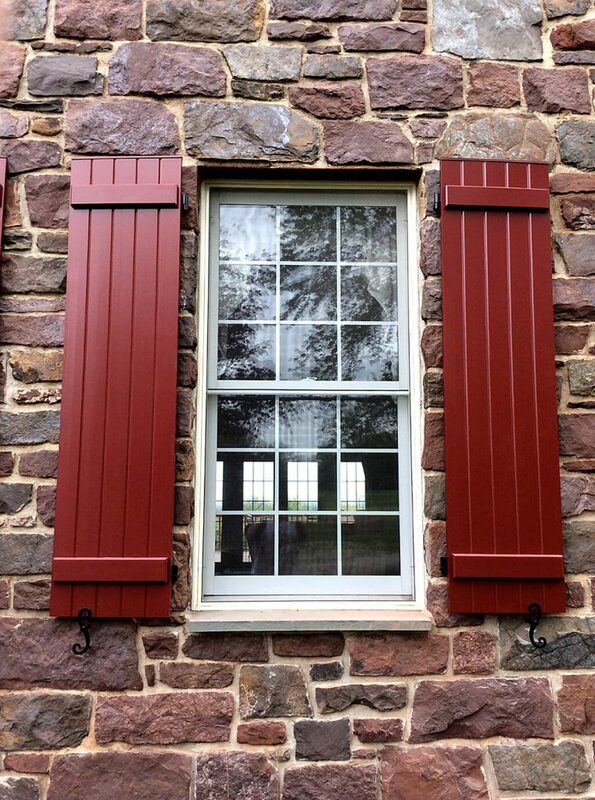 Red Shaker panel shutters in a 33/33/33 configuration and installed to function, with rat tail tiebacks and heavy duty pintels. 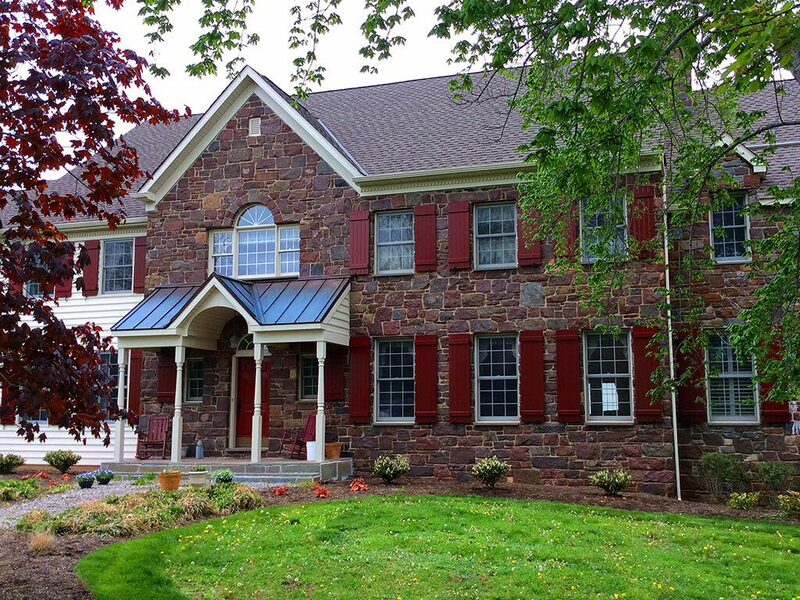 Red and tan are a perfect combo in this exterior design, feauting operable louvers on top and Shaker panel shutters on the ground floor, finished with decorative grape tiebacks and sill mounts. 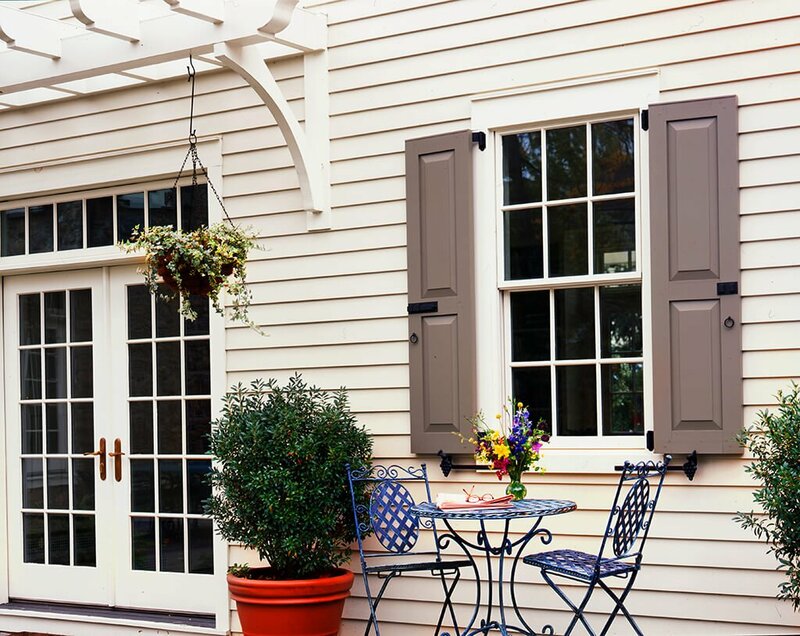 These 50/50 Shaker panel shutters are painted a custom taupe and sport a complete set of hardware, including slide bolts, pull rings, grape tiebacks, and sill mounts. 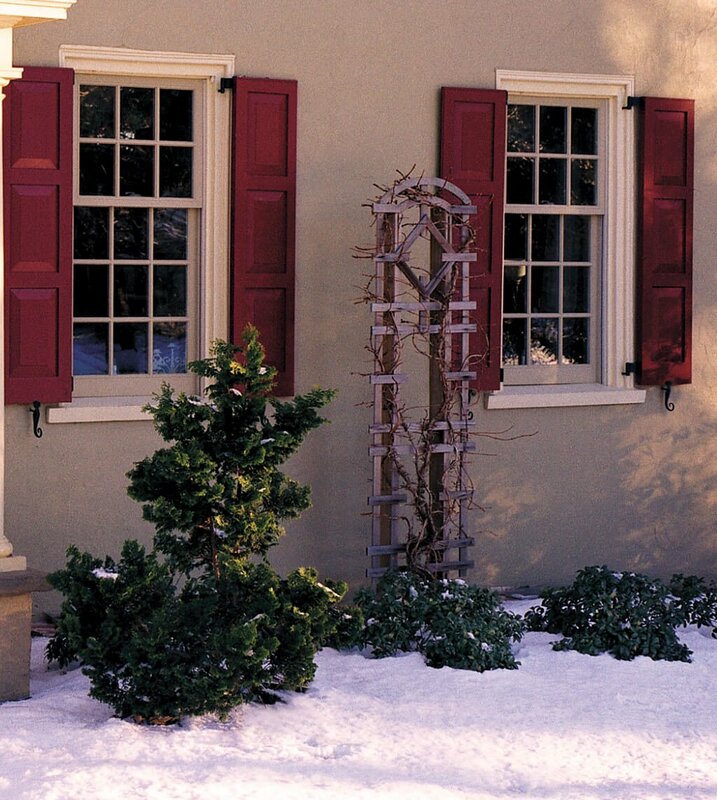 These white Endurian Shutters look right at home amongst the ivy, and feature a 20/40/40 configuration and classic sill mount hardware. 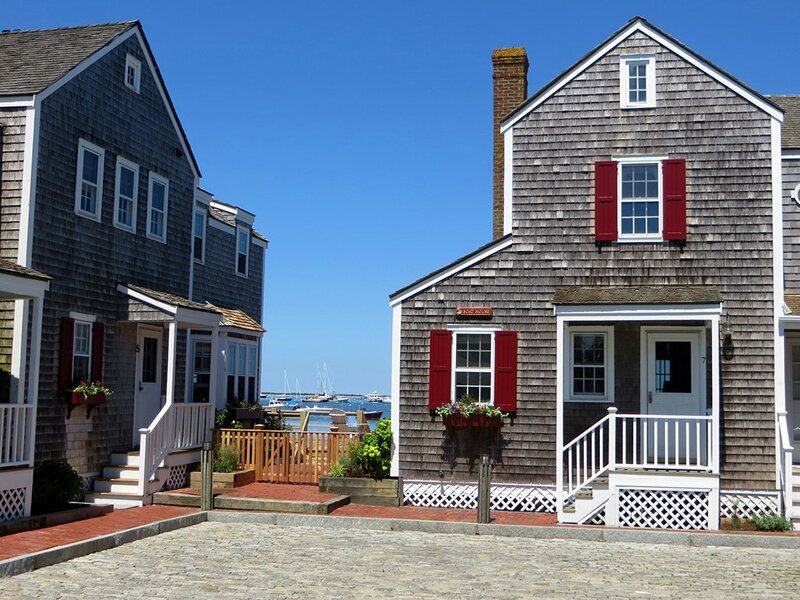 These lovely natucket boat houses look great with flat panel shutters in deep red. 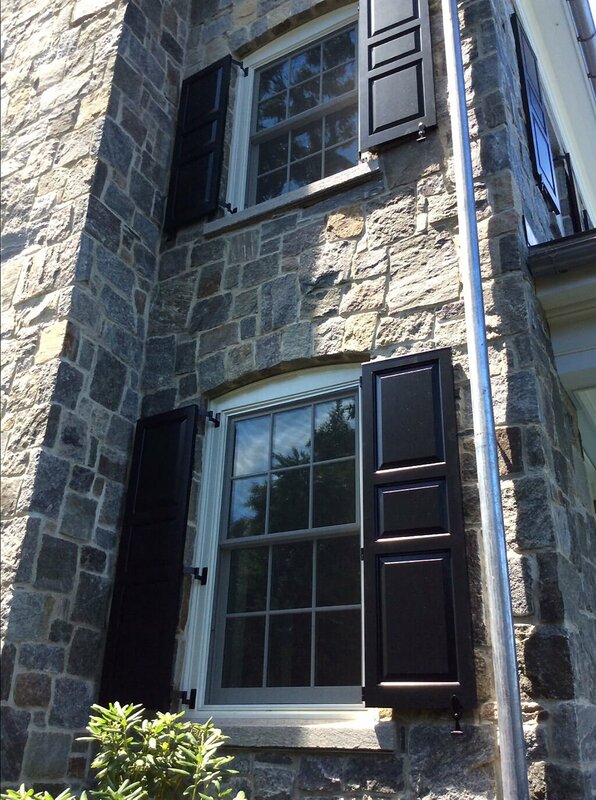 Detail shot of two configurations of black Shaker panels: a 20/40/40 configuration on the first floor, and 50/50 on top; both are finished with copper capping, shutter locks and rat tail tiebacks. 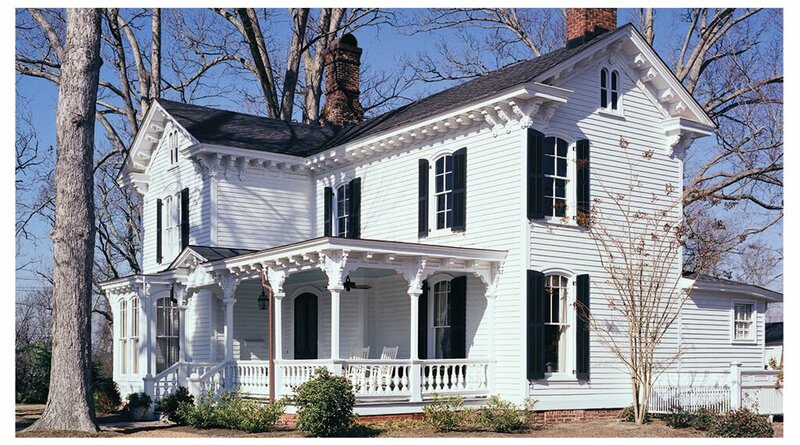 This stately Federal Colonial wouldn’t look complete without these classic, black panel shutters dressing its windows. 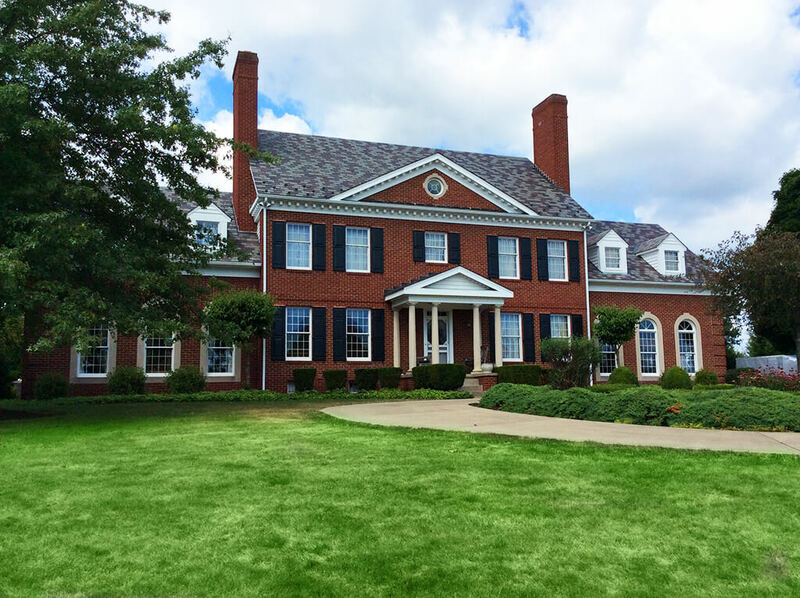 Red brick and black panel shutters make for a classic look, especially with the added copper capping, shutter locks and rat tail tiebacks. 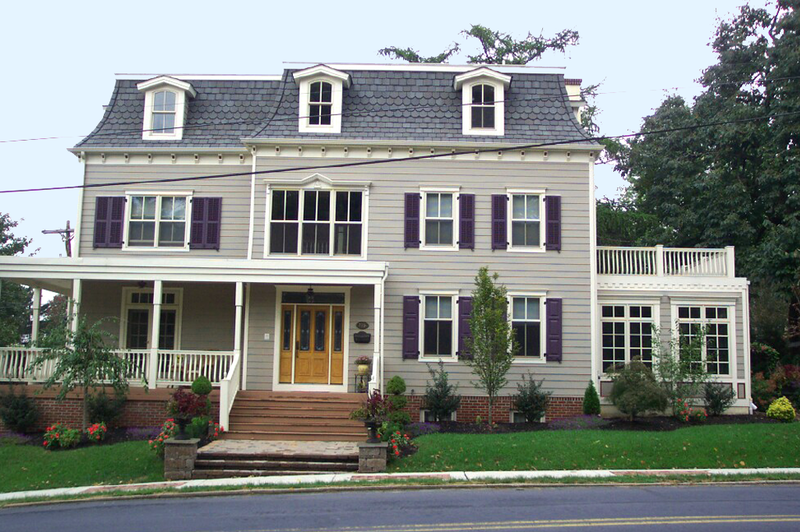 This traditional gray Italianate style home features black fixed louver shutters with a custom middle style. 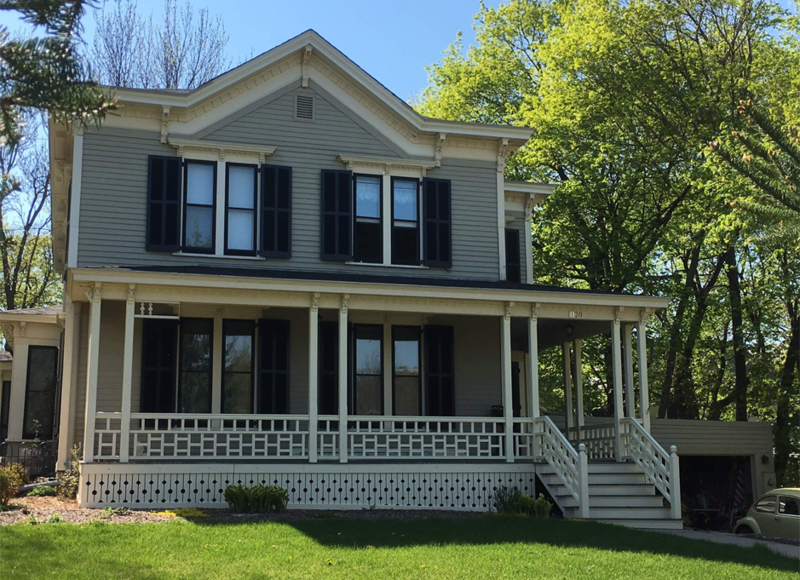 This gray Victorian home is the perfect canvas for these custom made purple shutters. 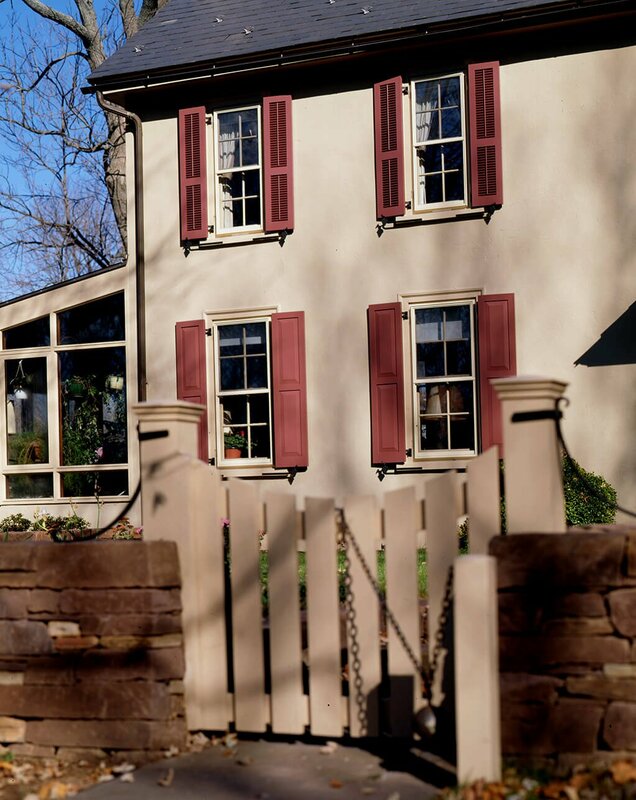 The first floor features panel shutters in a 30/30/30 configuration and operable louver shutters in a 50/50 configuration on the second floor. 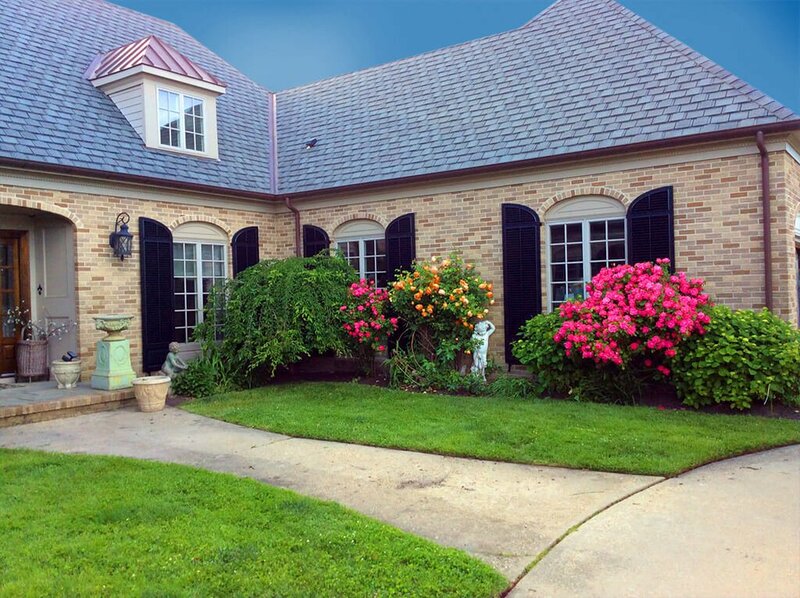 Also on the second floor are custom made bi-fold louver shutters which were made to accommodate for the extra width of that window.